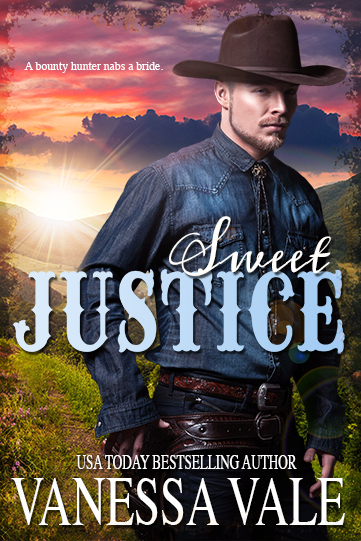 When Piper Sinclair finds herself hauled in by a bounty hunter in connection with her family’s crimes, the sheriff’s word that she wasn’t involved should be enough to make her captor let her go. But Wiley Easton isn’t buying it. He’s heard tell that a woman was involved in the crime spree that left several people – including his own father dead. If the sheriff won’t lock her up until the judge arrives, he’ll keep her captive and naked so she can’t escape. When the judge shows up the next morning to side with the sheriff and explain that Piper wasn’t involved, he’s furious to find that Wiley has kept an innocent woman naked in his hotel room. Because Piper has been so dishonored, the judge orders Wiley to marry her. Wiley Easton never considered himself the marrying kind. But now he not only has a wife related to his father’s killers, but one determined to help him track down the woman who almost sent her to the gallows on a case of mistaken identity. The chase won’t be easy, and along the way Wiley will learn that his new wife is headstrong, stubborn and passionate. As he awakens her to a new world of carnal delights, he becomes protective. But when the only way to track down a notorious female criminal means putting Piper in harm’s way, will this rugged bounty hunter be strong enough to risk her safety by going undercover in a gritty brothel?